Iberia Parish vital records are kept by the Court Recorder, who is located in the Clerk of Courts office. The office is located on 300 Iberia Street in New Iberia, LA, and is open from 8:30AM to 4:30PM. They also offer an online records index which requires an application as well as a monthly fee of $100. The application must be printed, filled out, and mailed to the Clerk of Courts, P.O. Drawer 12010, New Iberia, LA, 70562. For further questions, contact the office by phone at (337) 365-7282. Iberia Parish is home to Avery Island, the longtime location of the well known Tabasco sauce factory. 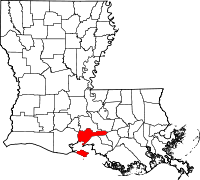 The parish has a large population, with nearly 75,000 residents, and due to its location directly on the Gulf of Mexico, has had a long and arduous history dealing with hurricanes and tropical storms.